As children, we had endless dreams of how our future would look. Some of us had dreams of becoming astronauts, some of us had dreams of becoming physicians, others pictured themselves of becoming famous actors or the lead singers in a band. Whatever the dream, we were able to day dream and change the dreams as we went along. What a wonderful feeling that was, to take a walk and just day dream. There was such a feeling of the world waiting, just for us. Somewhere along the way, we stopped dreaming and stopped believing in the endless possiblilties that life has to offer. At what age did you stop dreaming? At what age did you give up on your dreams? We can become overwhelmed by the daily tasks of life – our families, our jobs,our relationships, our responsibilities – yet all are connected to our original dreams from childhood. Somewhere inside of each of us these dreams still exist, but in a different form. 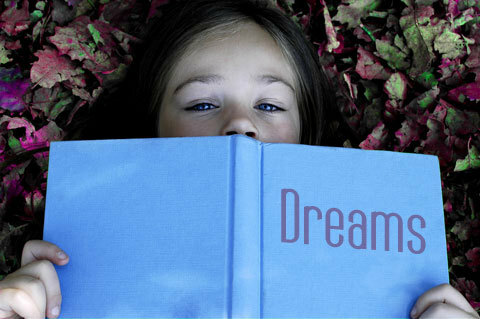 As in childhood, our dreams change and develop as we are faced with the different challenges of life. challenges. I invite you to be at one with your dreams. So close your eyes for a minute, take a few cleansing breaths, and picture your dream. Be in that moment. Open your eyes and write down your dream for today on a small piece of paper. Take this with you throughout the day. Look at the note during lunch, and put it on your bedside table and look at the note before you fall asleep. Look at the note the first thing in the morning, take a cleansing breath, close your eyes and picture your dream. Remembering to dream is a wonderful gift that only you can give to yourself. hi!,I really like your writing very a lot! share we be in contact more approximately your post on AOL? I need a specialist in this area to unravel my problem. Maybe that is you! Looking ahead to see you. I can describe this material in one word: Incredible! I am highly impressed with this information and how it’s written. Keep up the good work. Thanks for your marvelous posting! I truly enjoyed reading it, you might be a great author.I will ensure that I bookmark your blog and definitely will come back at some point. I want to encourage yourself to continue your great writing, have a nice day! Fantastic items from you, man. I’ve consider your stuff previous to and you are simply extremely wonderful. I actually like what you have got here, really like what you are stating and the way during which you assert it. You are making it enjoyable and you still care for to stay it wise. I can not wait to learn much more from you. That is actually a great site. Thanks for the marvelous posting! I truly enjoyed reading it, you will be a great author.I will always bookmark your blog and definitely will come back from now on. I want to encourage that you continue your great work, have a nice afternoon! Real nice pattern and superb content material , very little else we need : D.
I’m honored to get a call from my friend immediately he found the important ideas shared on the site. Examining your blog article is a real brilliant experience. Many thanks for considering readers like me, and I wish you the best of achievements being a professional in this area. Thanks so much for giving everyone an update on this issue on your website. Please realise that if a new post becomes available or when any modifications occur with the current post, I would want to consider reading more and learning how to make good usage of those strategies you write about. Thanks for your efforts and consideration of other folks by making this web site available. The methods stated in this post concerning to increase traffic at you own webpage are in fact fastidious, thanks for such pleasant post. I went over this web site and I believe you have a lot of superb info, saved to my bookmarks (:. It’s my first visit to this site, and I am truly surprised to see such a nice feature YouTube video posted at this place. Some genuinely good information, Sword lily I found this. “To be conscious that we are perceiving or thinking is to be conscious of our own existence.” by Aristotle. I truly appreciate this post. I have been looking all over for this! Thank goodness I found it on Bing. You have made my day! Thx again! “All that is gold does not glitter not all those that wander are lost.” by J. R. R. Tolkien. Simply wanna comment on few general things, The website design and style is perfect, the content material is really fantastic. “To establish oneself in the world, one has to do all one can to appear established.” by Francois de La Rochefoucauld. You have brought up a very good points , thankyou for the post. “Beginnings are apt to be shadowy and so it is the beginnings of the great mother life, the sea.” by Rachel Carson. Thank you for keeping this site up. You’ve guide is so simple that it makes CSS seem so easy. This article was surely a very excellent read. My spouse and i ended up being surprised by the material of this article. I cannot wait to see what different you might have waiting for you for all of us. I am certainly looking forward to the following publish. Thank you for revealing! I’ve been surfing online greater than 3 hours today, but I never discovered any fascinating article like yours. It is beautiful price sufficient for me. In my opinion, if all site owners and bloggers made just right content as you probably did, the net will likely be much more helpful than ever before. “It’s all right to have butterflies in your stomach. Just get them to fly in formation.” by Dr. Rob Gilbert. I had been honored to receive a call from my friend when he found the important tips shared on the site. Examining your blog post is a real wonderful experience. Thanks again for taking into consideration readers just like me, and I wish you the best of achievements as being a professional in this field. Very fantastic info can be found on web site. “Many complain of their memory, few of their judgment.” by Benjamin Franklin. This is going to be the right weblog for anyone who actually wants to discover this topic. You realize a terrific deal its almost challenging to argue to you (not that I in fact would want…HaHa). You certainly put a entire new spin over a topic thats been written about for several years. Great stuff, just great! I ‘m very enjoyed for this particular blog. Its an useful topic. It help me very much to solve some problems. Its opportunity are so fantastic and working style so speedy. I think it may be help all of you. Thank you. Absolutely composed subject matter, Really enjoyed reading through. I’m impressed about this blog, all effort and time spent to write such a piece of art. It is amazing how interesting this blog is. I’m one of the biggest fans. You could certainly see your enthusiasm within the work you write. The arena hopes for even more passionate writers such as you who are not afraid to say how they believe. Always follow your heart. I wish I could write such a good blog. Considerably, the write-up is actually the greatest on this worthw hile subject. I concur along with your conclusions and also definitely will eagerly appear forward to your approaching updates. Saying thanks will surely not merely just be sufficient, for the exceptional clarity in your writing. I can at once grab your rss feed to stay informed of any kind of updates. Genuine function and significantly success inside your business dealings! I like this blog it’s a master piece! Glad I detected this on google. I just added this site to my feed reader, great stuff. Can not get enough! Just wanna remark on few general things, The website style is perfect, the written content is really wonderful. “Believe those who are seeking the truth. Doubt those who find it.” by Andre Gide. All that has been already posted here is definitely noteworthy. I just added this webpage to my feed reader, excellent stuff. Cannot get enough! Numerous thanks for the wonderful post C I’d enjoyable reading it! That i love this weblog. Thanks for this post. You always write a intriguing blog post. I will come back soon. I don’t commonly comment but I gotta tell regards for the post on this amazing one :D.
I enjoy you because of your own hard work on this blog. My daughter takes pleasure in working on investigation and it’s really easy to see why. We notice all concerning the powerful mode you present great items on the website and as well as strongly encourage participation from some other people on the concern while our daughter has been starting to learn a great deal. Enjoy the remaining portion of the year. You have been carrying out a brilliant job. In my opinion everyone should visit this blog and spent some time here because it’s so good. I would suchlike to here from you. It’s not something I usually do! I enjoy reading posts from people who think. Also, thanks for letting me comment. I’m commenting to make you understand what a exceptional encounter my wife’s child found browsing your web page. She came to find many things, which include how it is like to possess an excellent giving character to let many more with no trouble fully grasp selected problematic topics. You undoubtedly surpassed people’s expectations. Thank you for displaying those essential, healthy, educational and also easy tips about your topic to Evelyn. You should make this post like into a definitive guide or something. I bet a lot of your new readers that come to this site would want to be able to find this post. It's too good to keep secret! could be sectioned into images types, like weddings, portraits and maybe other special events too. has ggot bands of excellent info . expected. If these qualities exists, you’re typically content with your experience. provide more exciting News to you. 4. I’m trying to find a template or plugin that might be able to resolve this problem. Thіs iѕ a topic that is close to my heart… Thɑnk you! Ԝhere are уouг contact details tһough? Its really Interesting information and helpful, I want to visit again and again your website to see more post/articles thanks for sharing such a cool post.